First, I just want to say thank you to all of you who reached out, left me comments and sent personal emails about my Grandpa. Thank you for all the thoughts and prayers, words of encouragement, and especially those of you who shared about losses of your own. It’s been overwhelming to see how the life of one man close my heart touched the hearts of so many of you, too. I appreciate your kindness and thoughtfulness more than you know! I decided that since my friends liked them so much, I should put them in my etsy store, because maybe others would like them too. And sure enough, instant hit. 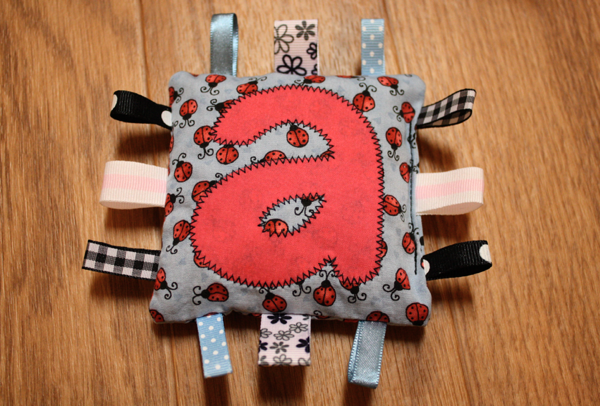 Then etsy pulled my listings because Taggies brand has an EXTREMELY vague patent on looped ribbon. I was really angry and put the bean bags on the back burner. 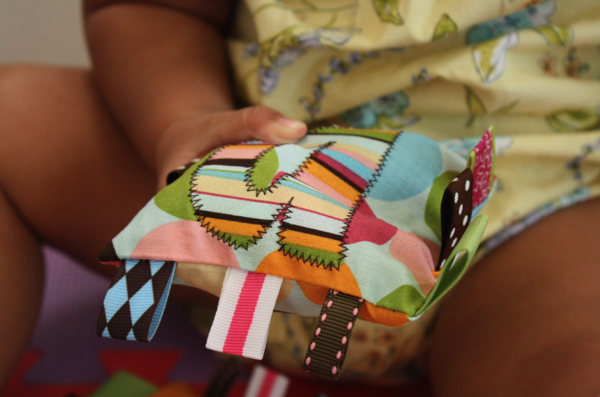 But my friends continued to ask for them for shower gifts, birthday gifts, and as toys for their younger or older kids. 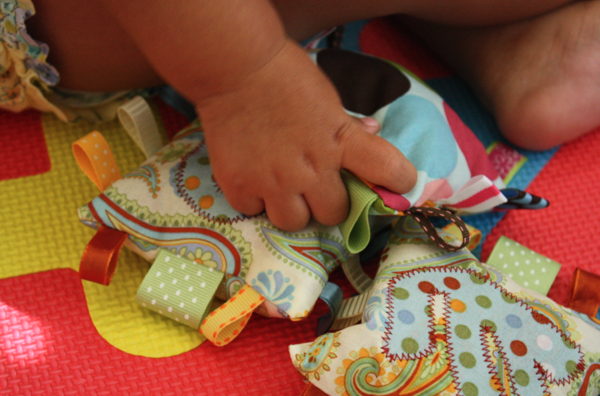 These little bags have all kinds of great features. My favorite part is that they’re completely customizable. 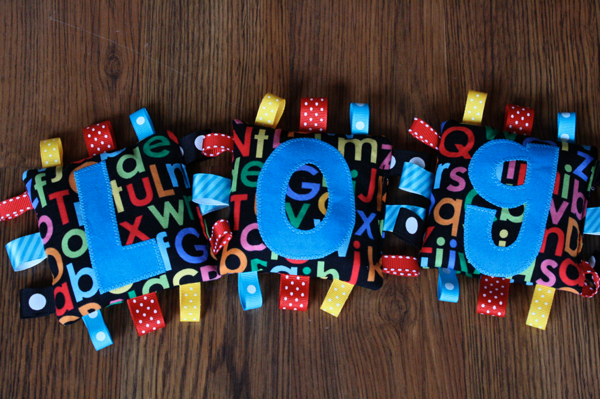 They provide tactile fun from the ribbons, and help kids learn to recognize and spell their names. And, they’re fun! Who doesn’t love a good bean bag? 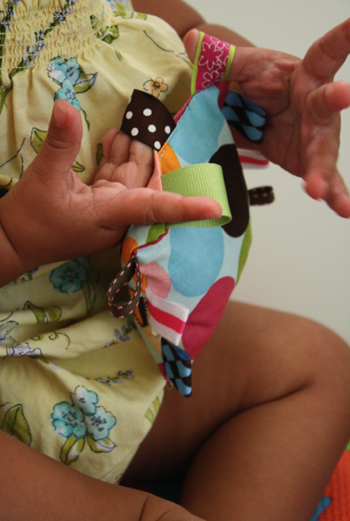 The loops are big enough they can get their fingers in them, helping develop fine motor skills, but they’re not big enough to get their fingers twisted or stuck. 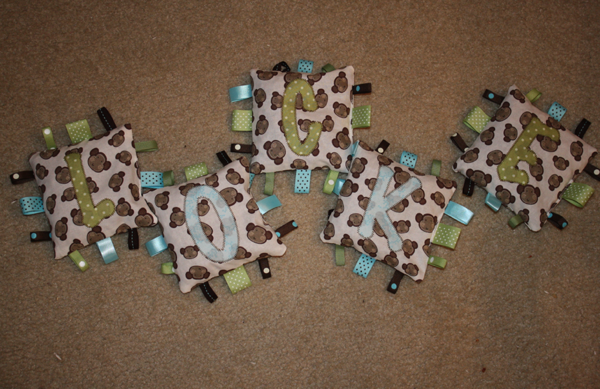 So I figured since I can’t sell them in my store anymore, I’m sure others would like to know how to make them, too! So here’s the deal. If you PROMISE not to sell them, I’ll tell you how to do it. Deal? I don’t want Taggies coming after me again! 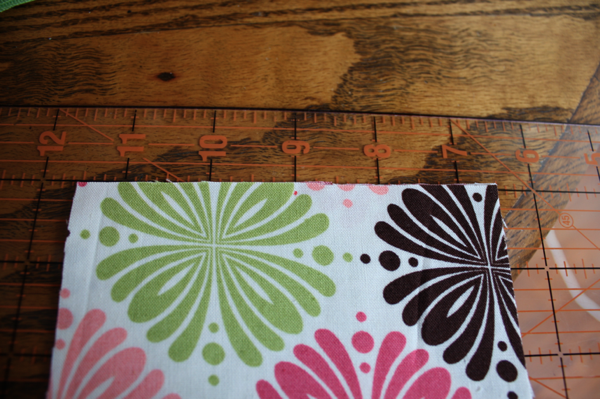 Start by cutting your fabric into 5″ squares, two at a time (the back and the front of each bag). 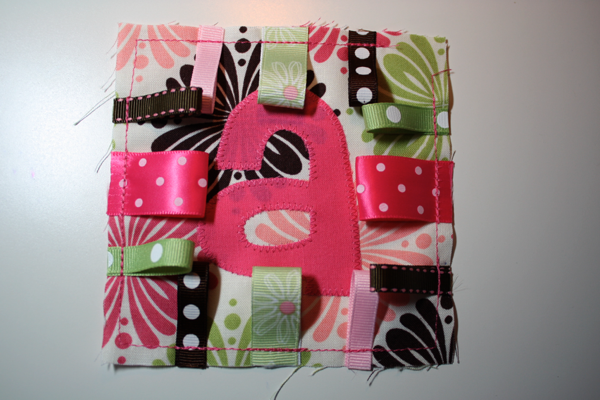 I was making the name “Abbey” so I cut five sets of squares. 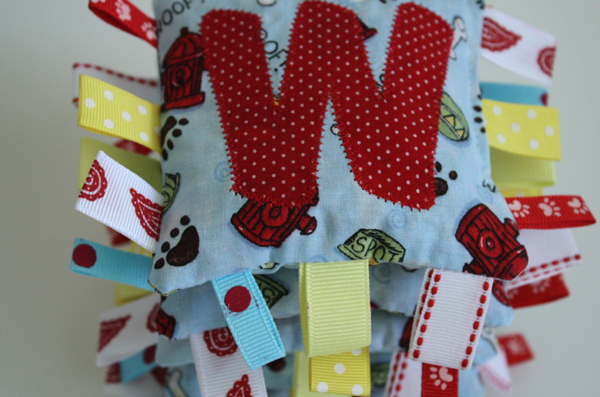 You’ll need to mark on each bag where your ribbon goes. 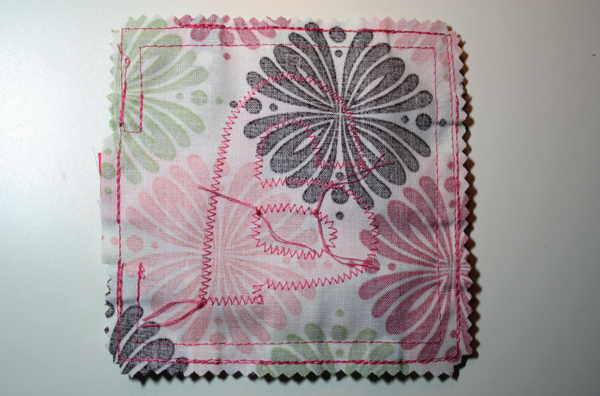 Start by making a dot in the middle (2.5″). 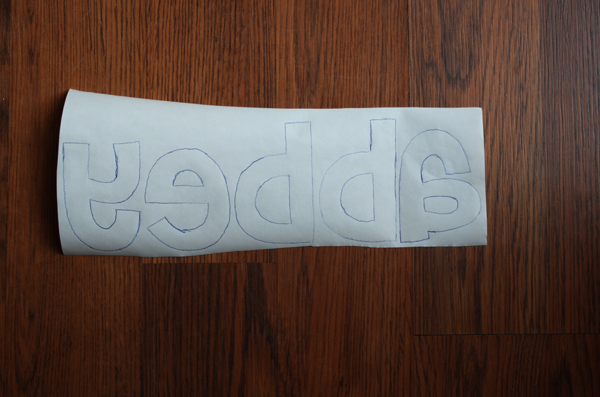 Then make a dot 1″ on each side from that one. 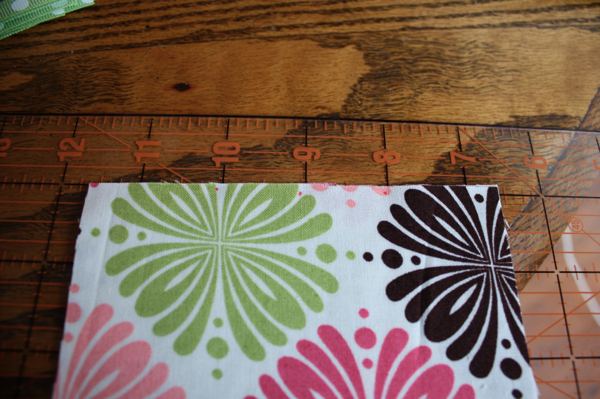 You don’t have to worry about using fabric-safe marking devices because these will be cut off. 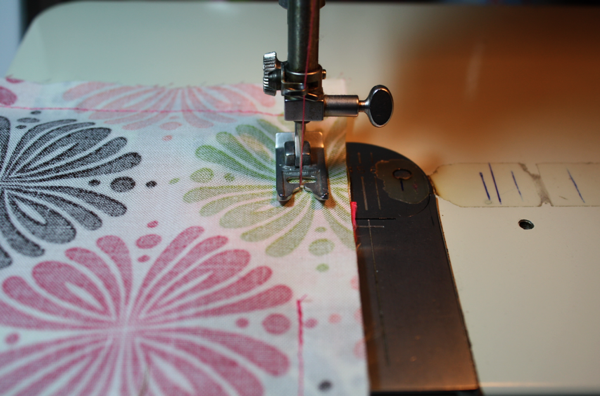 I usually use a permanent marker so I can see the mark on any print fabric. Repeat on all 4 sides of each bag. 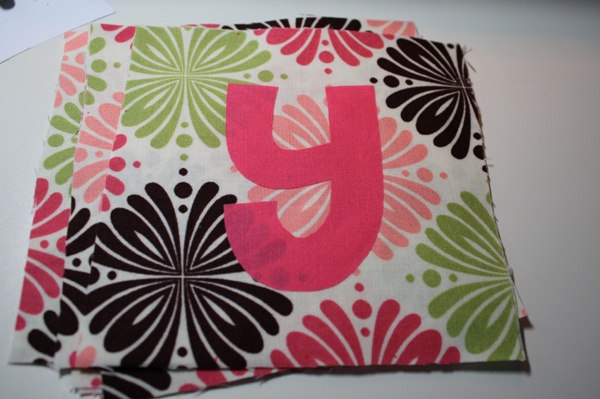 Then trace the name backwards on Heat n Bond Lite, iron to the wrong side of your coordinating fabric, and cut out. Iron the letters to the middle of each bag. 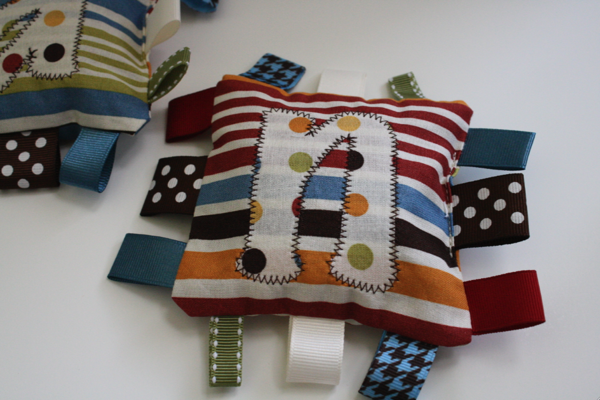 The letters I use are 3″ tall and 3″ wide. 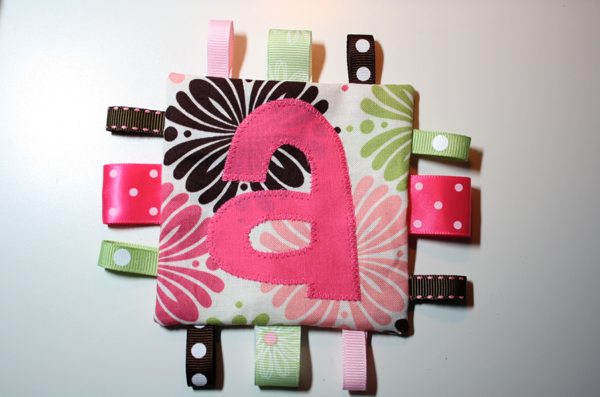 Applique the letters to the front side of each bag. 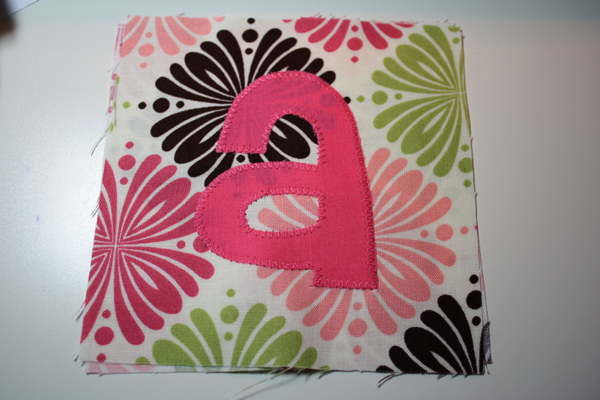 If you need help, see my applique tutorial. Now attach the ribbons. 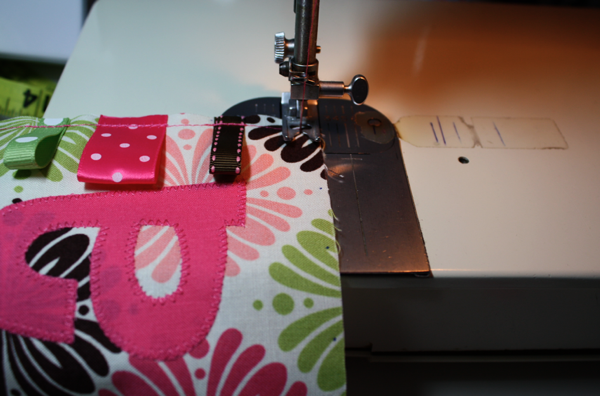 You need 36″ of ribbon for each bag, cut into 3″ sections. 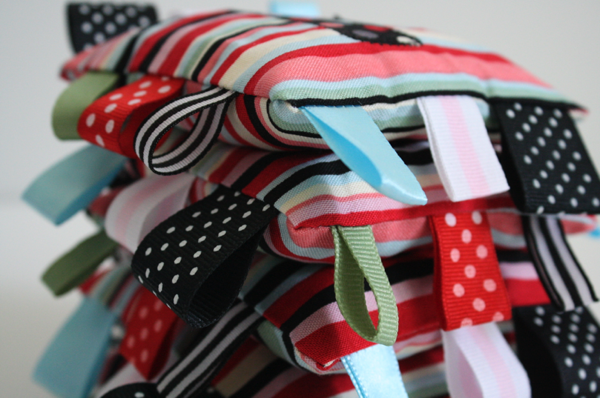 I like to use 6 different styles of ribbon, but you can use 1, or 3 or 12, it’s totally up to you! I cut all of my ribbons for all the bags at once. 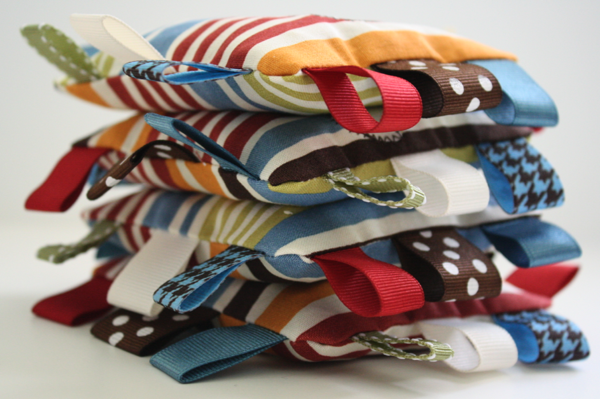 30″ of each style (2 ribbons of each print, 3″ of each, times 5 bags). 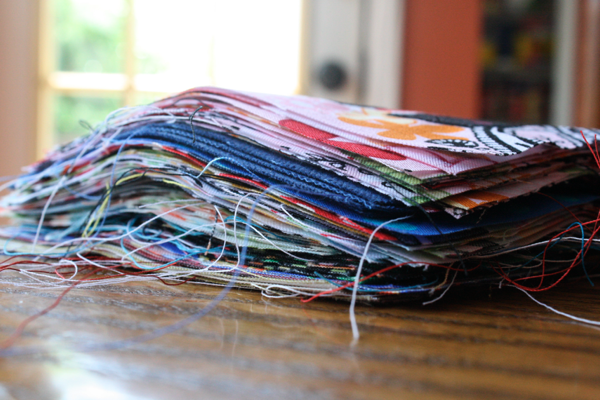 I personally like to lay the ribbon out before I start sewing. I try to keep any of the same color from being next to each other, and I also like to separate prints (though I had to have polka dots next to each other this time). I try to use ribbon of varying sizes, and I keep the widest ribbon in the middle. I always use them left to right and in the same order on each bag. But all this is just my personal preference! 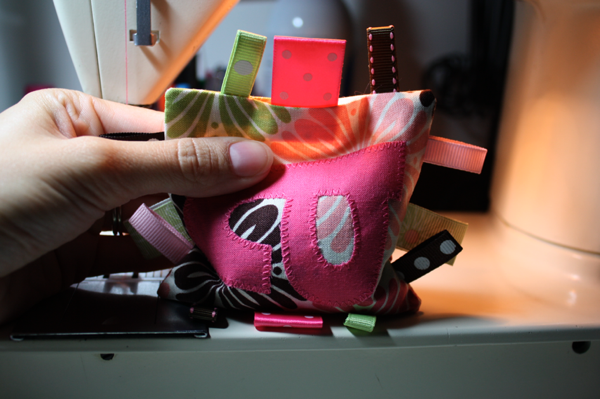 To sew the ribbon on, choose the piece you want to start with, fold it in half with wrong sides together, and line the edge up with the edge of the bean bag. I always start on the right side of the bean bags. Place the ribbon on the OUTSIDE of the top dot. 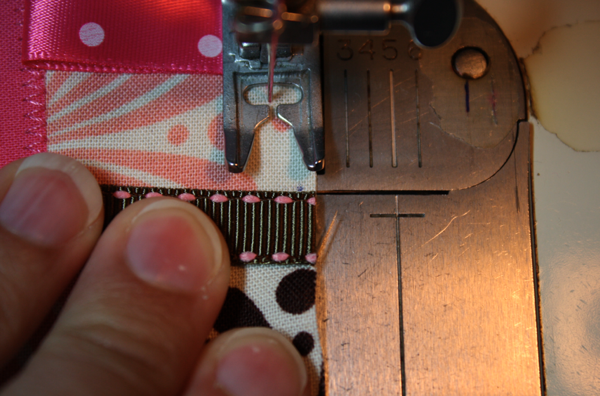 Then stitch over the ribbon several times using a 1/4″ seam allowance. 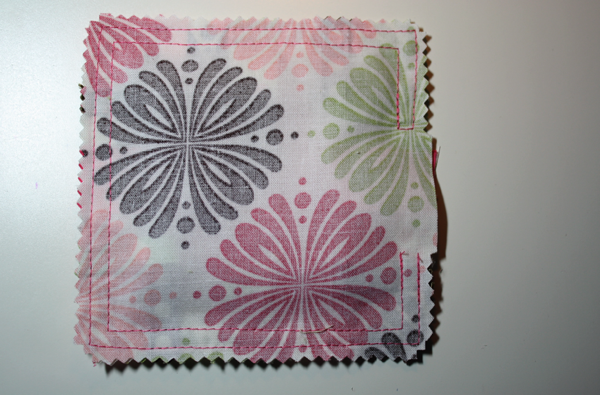 Pick up your second ribbon, fold in half, and CENTER it on the middle dot. 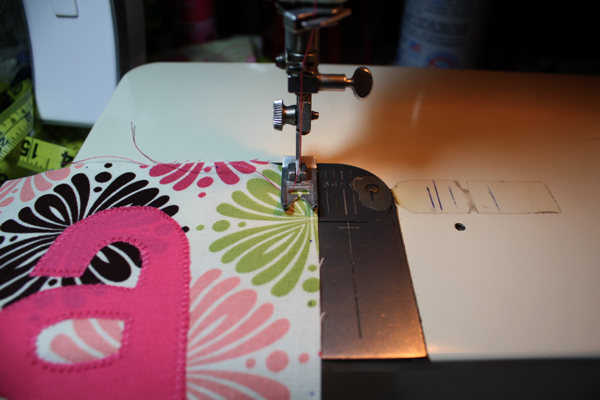 Stitch on. Get your third ribbon, and place it on the OUTSIDE of the bottom dot. 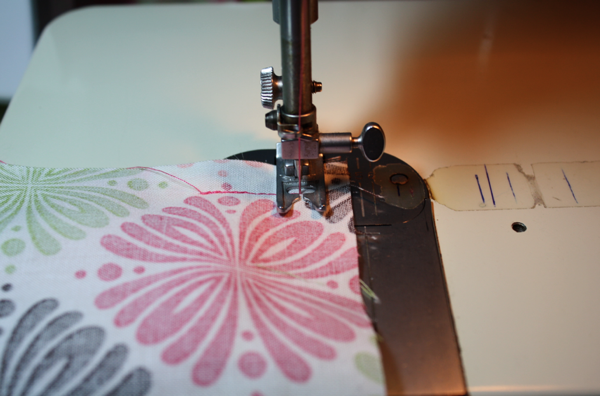 Sew to the bottom of that side, leaving 1/4″ inch at the bottom, put the needle in the down position, and turn your fabric 45 degrees so you’re ready to sew down the next side. 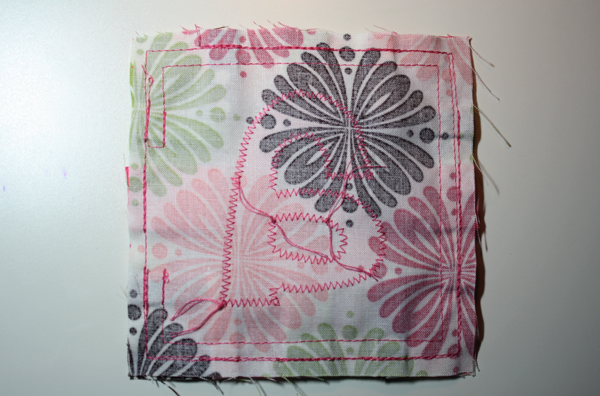 Repeat the ribbon-sewing process on the three remaining sides. Take the back piece, and put right sides together. Now we’re going to sew around the perimeter. 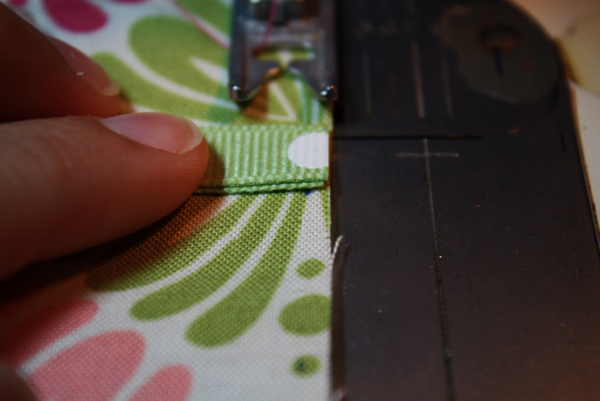 We need to leave an opening to turn it through, so I start sewing at the TOP of the BOTTOM ribbon. **Just like with the ribbon, I start on the right side of the bag. There’s no science to it, I just like to do them all exactly the same. until I get back to the same side I started on. 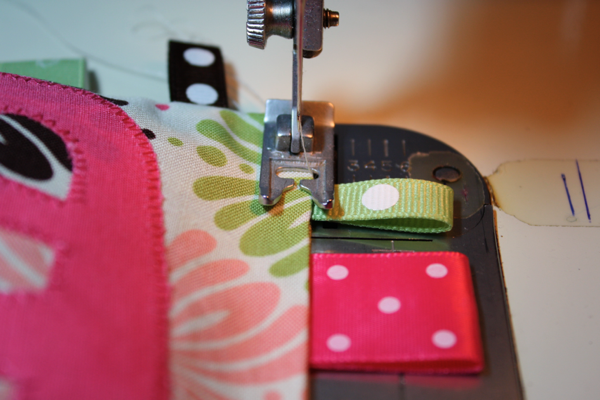 I sew to the BOTTOM of the TOP ribbon. This will leave a hole exactly 2″ big to turn through. 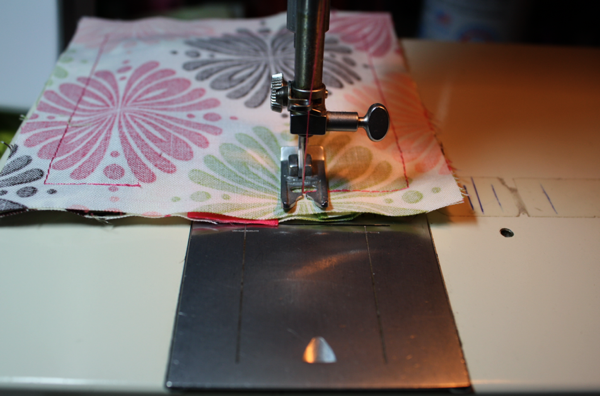 sew over 2 stitches to 1/4″ seam allowance, and sew back around to my starting point. 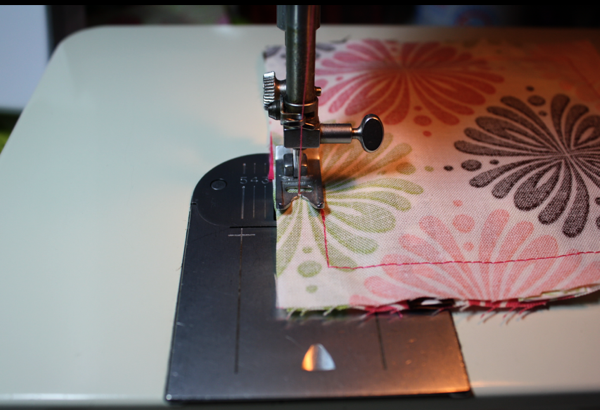 This gives the bags a double seam to ensure good quality, and it puts 3 seams on the ribbons, making sure they don’t come out. 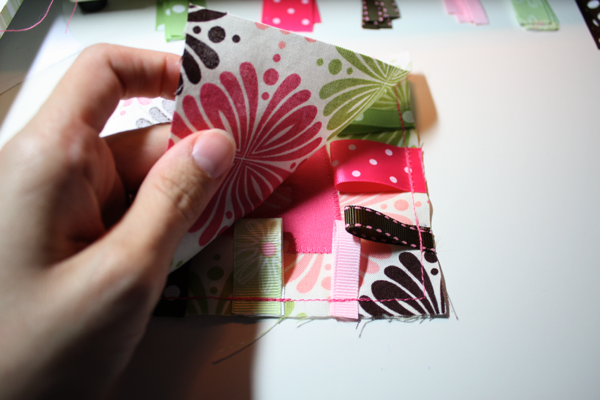 Since the project has corners, they need to be clipped to prevent bunching when turned the right way. I prefer to just cut the whole thing with pinking shears. 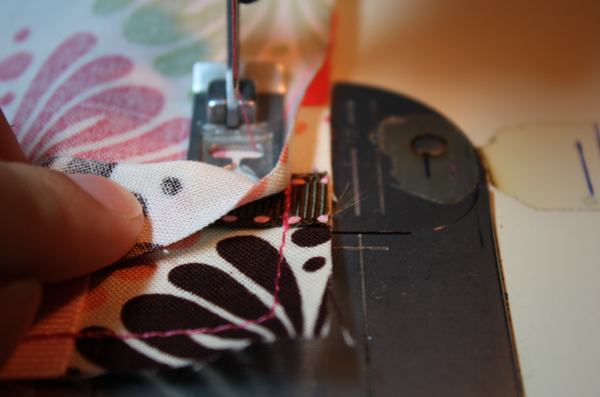 Make sure you don’t cut any of your seams! I DO NOT cut the fabric at the opening. Turn the bag through your opening (it helps to stick 1 finger in the hole, grab one of the loops from the opposite side and pull it through) and push the corners out using a pencil or chopstick. At this point I usually hit them with a hot iron to get rid of any wrinkles that might have cropped up during the sew and turning. For filler, you can use whatever you want, really. They make pellets for dolls and things now, so if you prefer to go that route you can. I was selling these for a few dollars each, so I needed to keep my costs low. And, after all, they are bean bags! 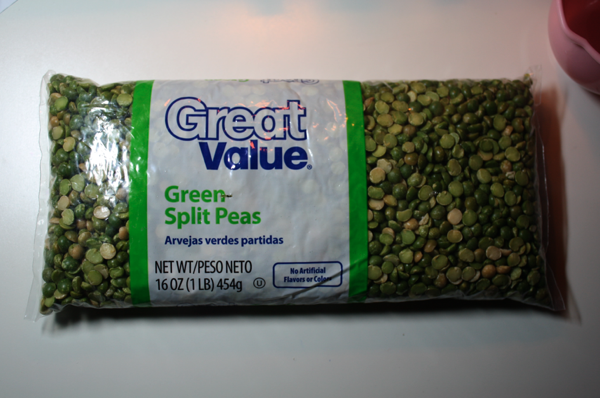 I used to use pinto beans, but The Hubs talked me into split peas later on down the road, and I prefer the smaller peas! Since these are made with real beans, you have to be careful in getting them wet. 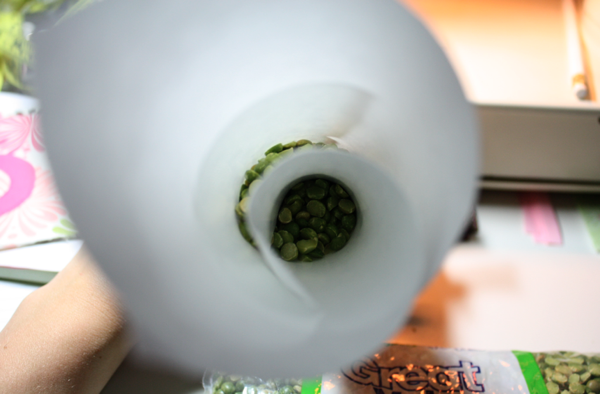 If you’re afraid of stains or messes, you might want to go with poly pellets instead of beans to prevent any sprouts from growing! If you have a funnel, this will be easy for you. If you don’t, get a scrap of paper and make it a tube, then place in the hole. Then fill with 1/2 cup of beans (or pellets). You don’t want the bag more than about 2/3rds full, so 1/2 cup should be all you need. 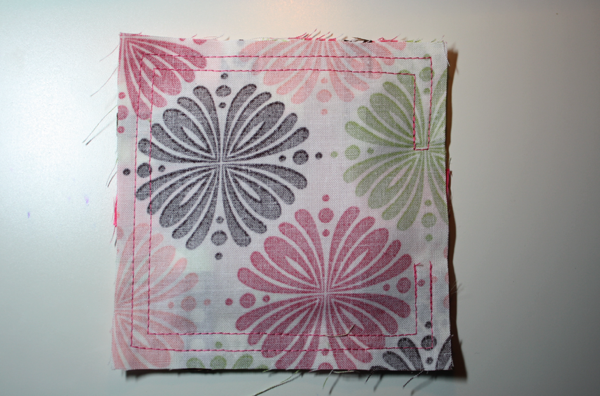 Then sew the hole closed. 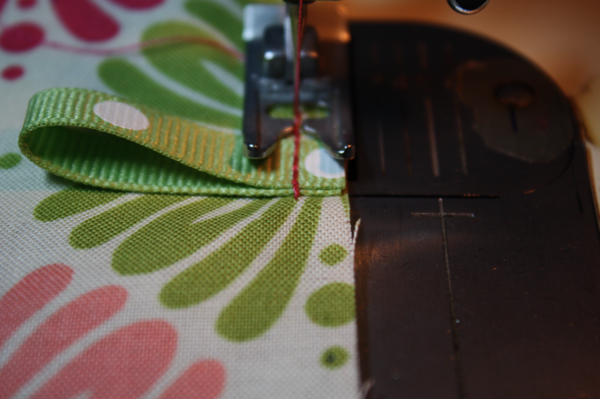 I use fabric that matches the bag to prevent it from being too noticeable. If I don’t have matching, I’ll use coordinating. 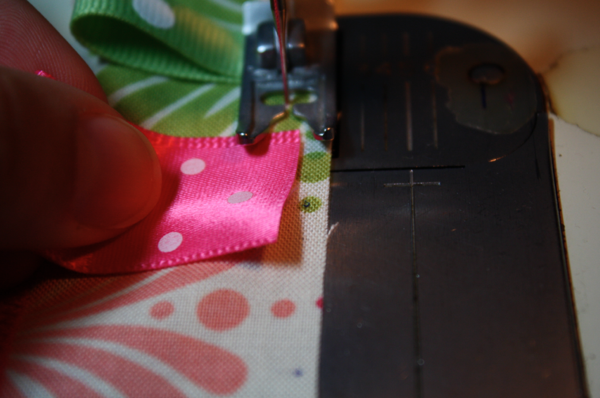 I sew from the top of the top ribbon to the bottom of the bottom ribbon to make sure there’s no little gaps. And that’s it! They’re quick and easy and oh-so adorable! Now go an make a million. But remember, please don’t sell them! Thank you so much for posting this awesome tut;)!! Great Job even my left handed add mind picked right up on how to make them. I’m last min. making for my sons school festival for tomorrow. I better get busy;)! 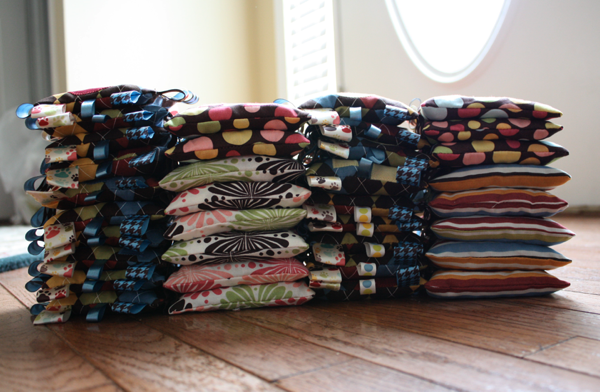 I have 20lbs of beans and yds of fabric. Thanks to your tut it will be a snap;)!! Thank you again;)!!! Just wanted to let you know. I came across your tutorial while searching for weighted vests for my autistic son. Your pattern came in very handy. 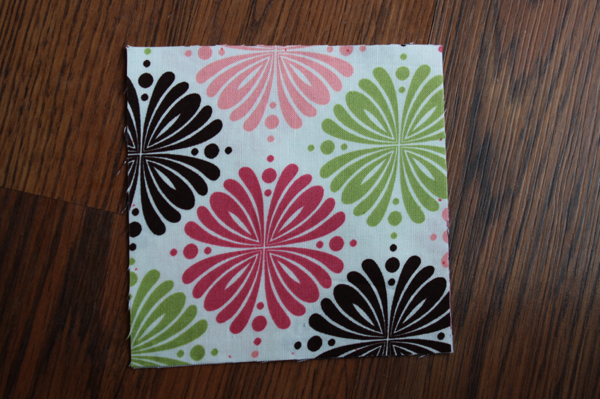 I chose my fabrics in different textures, and even used iron-on vinyl on one of them for another texture. 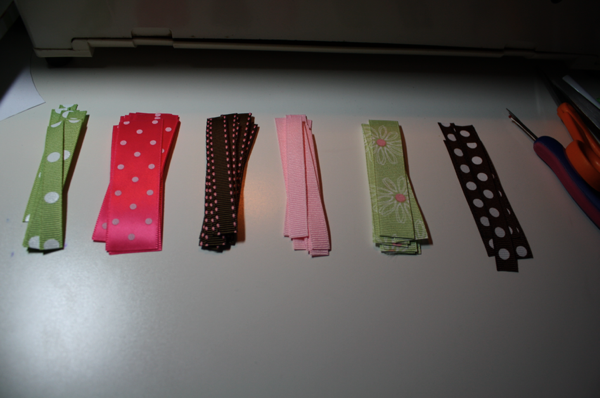 I also chose the ribbons for the different textures, for more tactile “therapy”. I even put the letters of his name on them as you suggested. I then had to measure out the “beans” for the beanbags because they had to equal a specific weight to be added to the vest. Once pockets were added to his vest, the beanbags fit in perfectly. They are the perfect addition to his “therapy”, as they serve a dual purpose. Thank you so much for posting this. I AM going to speak with an attorney however. 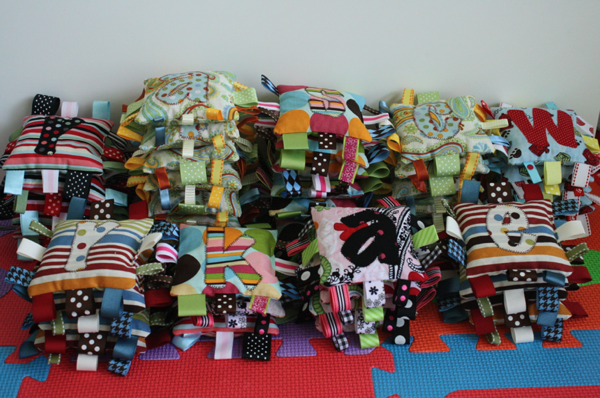 I have been asked by other parents of special needs children, about making some for them. They want to pay me for them, and I believe as long as I don’t “sell” them, it is ok. However, I believe I can ask for reimbursement for time and supplies. 🙂 Just thought I’d mention that to you. Just curious as to why these cannot be made for sale by others. Do you have a patent for these items? I am new to all of this and was just wondering. No Ellaine, I don’t have a patent. Taggies does. I talk about it in deeper detail throughout the beginning of the post. I have come up something better than a funnel for quick, spill-free filling. Take an (empty!) 16 oz plastic Dr. Pepper bottle, cut off the top just above the label with a pair of sturdy scissors or snips. 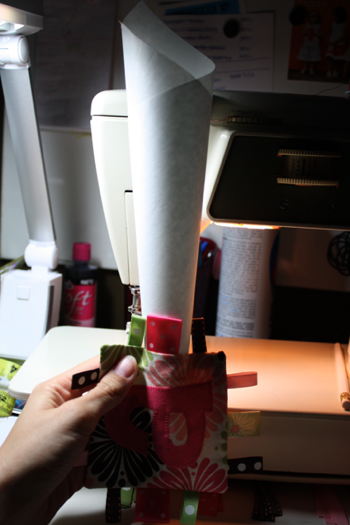 Place the neck of the now cut-off bottle into the opening in the seam of the bean bag, fill it with pellets or peas and jiggle the contents out into the bean bag. Voila! Great tutorial, so sorry you had a run in with taggies – I knew they could protect their name but putting ribbon on a toy, come on guys! Going after the little guy. 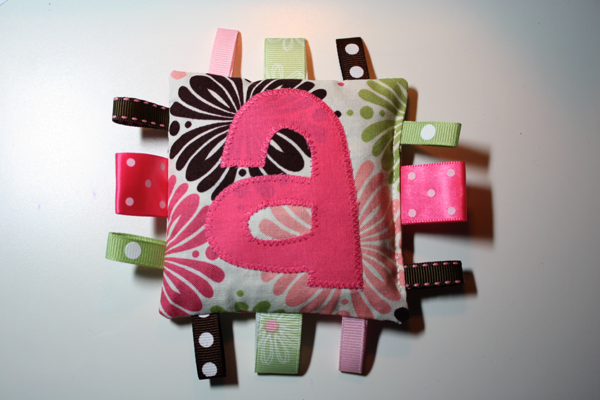 Thanks forposting – I plan to make some as baby gifts but I am going to try that crinkle filler stuff and see how it works. no weight but could be fun. I just made 14 of these in two days! (Two sets, both kids have 7 letter names.) Thank you for such an easy to follow tutorial! I can’t wait to make these over and over again. I’m giving these sets away on Saturday and can’t wait to see my sister’s reaction! How do you make these washable? By using poly beads for filler instead of real beans. Thank you for your very-easy-guide-to-follow. Your bean bags are awesome.